A selection of TEM grids with reference patterns to enable relocating a particular grid area. 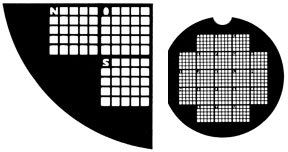 Theses grids are known as reference, locator, finder or index grids. A number of different patterns have developed with either symbols or alphanumeric coding to quickly find a specific field. 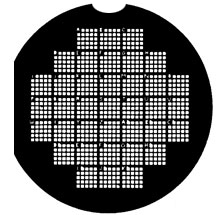 The locator or finder grids enable quick and easy checking of a particular feature at a later time or on another TEM. Exact grid square definition is a requirement in forensic and asbestos analysis. Another feature of the reference TEM grids is that when moving around on the grid, earlier found features or particles can be easily relocated. All reference grids are available in copper, some in gold or nickel. These grids are found to be very useful for AHERA studies. Clean and sharp lines. Index l is 75 mesh for the strong bars and each square is bisected in both directions with thinner bars. Standard Mesh, hole 94µm - bar 31µm, "µ" center mark. Each of the 60 square grids is identified using a base two binary numbering system. The six binary number symbols appear on the bottom grid bars along the horizontal axis. Zero is represented by a short pillar and one by a longer pillar. The enlarged section shown is of grid square no. 9 - a long pillar at the extreme right represents decimal 1 and a long pillar fourth from the right represents decimal 8. Hole width, vertical axis= 210µ.